The Honda Grand Prix of St Petersburg marked the first time that the Dallara DW12 was unleashed with the opening of the 2012 IZOD INDYCAR competition. This weekend, the brand new race car will roam the sweeping, twisty road course of Barber Motorsports Park. 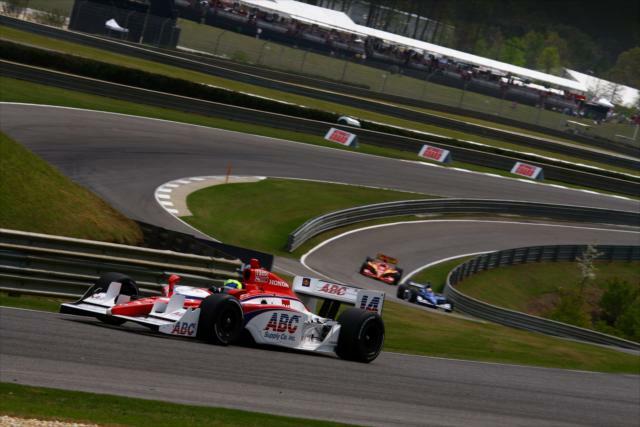 The visit to the 2.38-mile Barber Motorsports Park road course early in the season for the IZOD INDYCAR Series will be the third year in a row. Unlike the temporary St Petersburg street course, the race track of Barber Motorsports Park has already been lapped by the new race cars through a multi-day test session in 2012 IZOD INDYCAR pre-season. After the first-ever event with the updated racing vehicles, the 2012 IZOD INDYCAR Series' return to a multi-engine formula appeared to have contributed to a higher than accustomed to rate of mechanical issues for some race competitors compared to season INDYCAR seasons. The elevation changes and the high-speed turns of Barber Motorsports Park will provide another unique test for the new Dallara open wheel race cars. In a contentious engine battle between Chevrolet, Honda and Lotus, Chevy has claimed the initial upper hand when Helio Castroneves guided a Penske-owned vehicle to victory at St Petersburg. For fans, the Honda Indy Grand Prix of Alabama should provide an interesting spectacle. All 26 cars that debuted in the 2012 IZOD INDYCAR Series opener will be present at Barber Motorsports Park. Will Power will be looking to defend his pole which led to a flag-to-flag victory at last year's Honda Indy Grand Prix of Alabama.